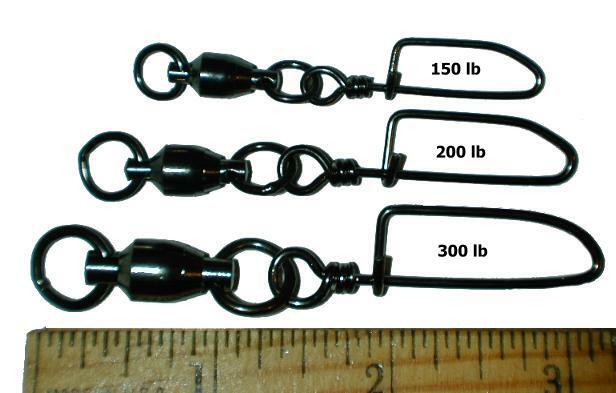 Ball bearing snap swivels black stainless steel components a must for the Big Game Fishermen. Nothing makes changing colors on your lure patterns behind the boat easier than Ball bearing swivels black stainless steel snap swivel! Keep these ball bearing swivels on the end of your main line always and lure changes become almost effortless as no new knots need to be tied! Perfect for fishing Marlin Tuna Wahoo and Dorado lures alike. Also can make drop back baits a snap as well! 3 sizes available and all stainless steel components. Whether you are trolling for Marlin Tuna or any other big game fish ball bearing swivels make changing a lure a snap.